Most people are familiar with the 1989 Oscar-winning hit movie Driving Miss Daisy, starring Jessica Tandy and Morgan Freeman. But perhaps lesser known is the fact that it began as an Off-Broadway play (also starring Morgan Freeman), and earned playwright Alfred Uhry the Pulitzer Prize. 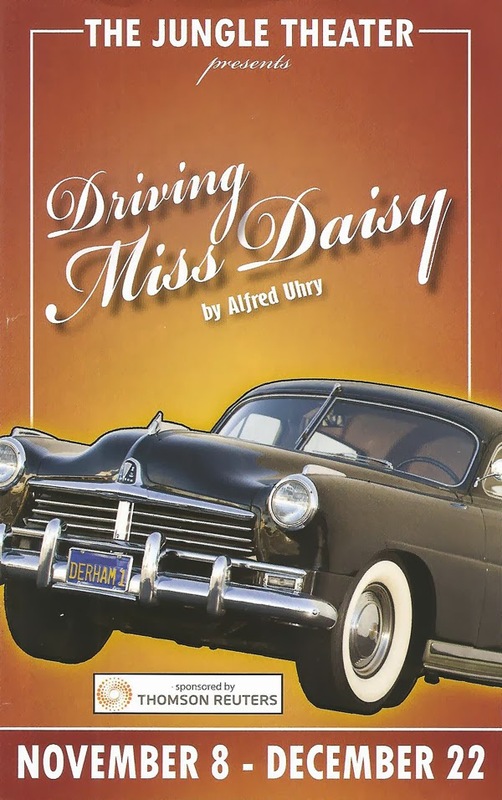 This play about the 25-year friendship between a wealthy white woman and her black chauffeur in Atlanta during the middle part of the 20th Century is a gem of a play, worthy of the acclaim. The Jungle Theater's production, playing now through December 22, is perfectly cast, and is simply a beautiful 80 minutes of theater. I'm sure you all know the story: 72-year-old widow Daisy crashes her car in the driveway, causing her son Boolie to hire her a driver despite her protestations. 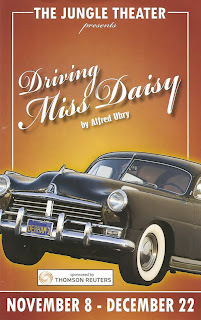 Hoke shows up at Daisy's home, unwanted by her, but she eventually allows him to drive her to the Piggly Wiggly, temple, family gatherings, and even a dinner honoring Martin Luther King, Jr. Over the years Daisy comes to rely on Hoke, and he becomes more than "the back of a neck" that she stares at in the car. This is a beautiful portrait of a true and lasting friendship, and an unlikely one at that. Quite simply, Daisy and Hoke are family, despite their differences. Wendy Lehr* and James Craven are both excellent as they physically and emotionally embody Daisy and Hoke, and have a wonderfully prickly and affectionate chemistry between them. They age 25 years in 80 minutes before our eyes, and do it gracefully and subtly, with a little more slowness and stiffness in each scene as time progresses. Charles Fraser completes this perfect trio as Boolie, with great love for and impatience with his mother and an unwavering Southern drawl. And like the slow Southern drawl, all of the actors take their time with the piece, nothing rushed or forced, but unfolding in due time. The Jungle's Artistic Director Bain Boehlke* directs and designed the set, once again allowing for the perfect marriage of story and setting. Four chairs and a steering wheel at the front of the stage represent the car, where much of the drama occurs. The characters mime every window opening and door closing, perfectly timed with sound effects (by Sean Healey). To the right we see Boolie's office, and to the left Daisy's living room, both specifically populated with details. In the center is a video screen showing the car or location, occasionally marking the passage of time from 1948 to 1973. All of these pieces are joined together with a theme of latticework, creating a charming Southern home. 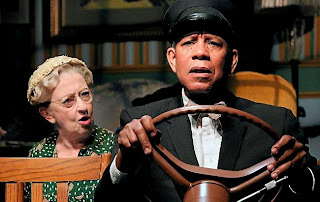 The Jungle Theater's Driving Miss Daisy is a compact and emotionally powerful 80 minutes of theater. Completely engrossing, funny, heart-warming, and utterly charming. Warning: you might want to bring tissues. *I had the great pleasure of being seated next to Wendy and Bain at the Patti LuPone concert at the Dakota a few months ago. It truly was one of the theatrical highlights of the year for me, to spend a little time with and chat with these two local theater legends. it actually got its start in Atlanta's Alliance theater before moving on to New York. Part of the beauty of the story is the delicate balance of being a religious minority and ethnic minority in the South and discovering that they had more in common than they did different. It is one of the more nuanced and beautiful stories of southern friendship, without stereotypes or parody. I'm so pleased that it's back so that more people can see it. Thanks for your insight, Kendra. It really is a special friendship, beautifully expressed in the play.